A student working in Jung-Mo Anh's lab helps with the ongoing research of a molecule that could help breast cancer patients. Anh has worked on developing this treatment with his team for the past five years. Photo by Anupam Gupta | Mercury Stafff. Editor’s Note: Picture caption originally misidentified Tae-Kyung Lee as Jung-Mo Ahn. A UTD professor and his team have developed a molecule that could benefit breast cancer patients who don’t respond to current treatments anymore. 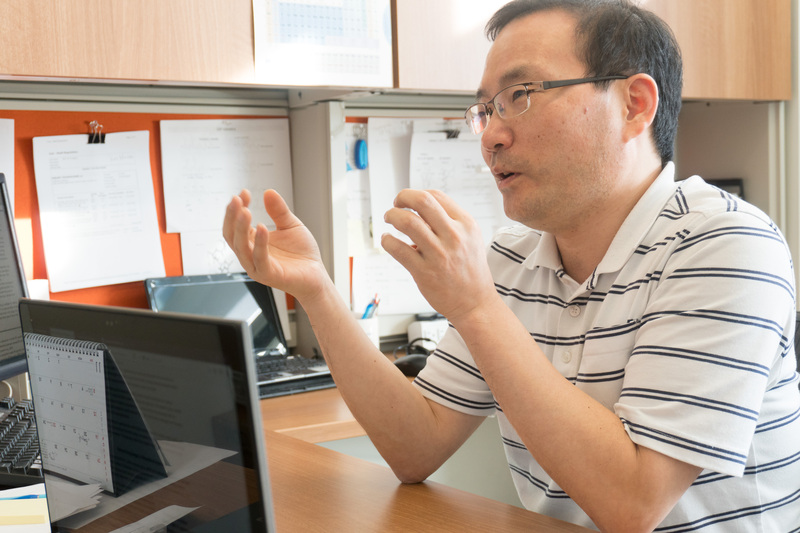 Jung-Mo Ahn, an associate professor of chemistry and biochemistry, and his team of researchers developed ERX-11, a molecule that works differently from molecules in other current breast cancer treatments. Their work was published on Aug. 8 in the online journal eLife. Ahn said the current breast cancer therapies work for a while, but in time, tumor cells develop immunity against these methods. Breast cancer cells contain proteins called estrogen receptors. These receptors bind to the hormone estrogen and help tumor cells spread through the body. Current treatments involve one of two approaches – limiting estrogen production in the body or blocking estrogen molecules from binding to their receptors. The molecule ERX-11 prevents the proteins activated by the tumor cells from mutating neighboring proteins. Ahn and his team started working on this idea around five years ago. They have been developing small molecules targeting protein-protein interactions from the start. Ahn’s research team, composed of research scientist Tae-Kyung Lee and chemistry graduate student Bikash Manandhar, helped with the molecule design and synthesis. They conducted the next phases of testing by collaborating with Ganesh Raj, a professor of urology and pharmacology at the Harold C. Simmons Comprehensive Cancer Center at UT Southwestern Medical Center, and Ratna Vadlamudi, a professor of obstetrics and gynecology at UT Health Science Center at San Antonio. Ahn and his team initially researched prostate cancer, and around five years ago, started working on breast cancer. Undergraduate and graduate students helped Ahn and his team by testing the molecule’s design at the cellular and animal level. Ahn said it is important to have students on the team because they bring a fresh perspective to the table. Research scientist Tae-Kyung Lee speaks about ERX-11, a molecule his team developed over the past five years to improve breast cancer treatments. Photo by Anupam Gupta | Mercury Staff. Ahn’s team of researchers and collaborators showed in their recently published paper that ERX-11 is much more effective in mitigating the growth of tumor cells. Lee said that despite the effectiveness, the molecule still needs to be refined. Ahn and his team are looking at a five to 10 years’ timeline to advance to further trials.